Πρόκειται για ιστοσελίδα του Πανεπιστημίου Θεσσαλονίκης με τις νέες εκδόσεις, επετηρίδες, βιβλιογραφίες, ειδήσεις και συνδέσμους που αφορούν τον τομέα της βυζαντινής φιλοσοφίας. Βρίσκεται στο στάδιο της κατασκευής, περιέχοντας λίγα στοιχεία προς το παρόν [Δυστυχώς η ιστοσελίδα φαίνεται πως καταργήθηκε]. This is a webpage of the University of Thessaloniki with new editions, yearbooks, bibliographies, news and links related to the field of Byzantine Philosophy. Currently it is under construction, containing few data [Unfortunately, the site seems to have been removed]. Μπορεί κανείς να βρει πάμπολλα ψηφιοποιημένα βιβλία και θεολογικά περιοδικά. – One can find many digitized books and theological journals. The Coordinator of the SIEPM Commission on Byzantine Philosophy is Katerina Ierodiakonou. This site of the SIEPM Commissions is currently under construction. More information will soon be available. The principle aim of this page is to serve as a hub for promoting and disseminating research on Byzantine Philosophy, as well as presenting news and events. In time, the administrators hope this page will serve as a resource to field works in progress for further comment and expand upon the growing knowledge. The initiative for the International Network for Byzantine Philosophy has arisen from the increasing body of published texts and studies in Byzantine philosophy. It is only in the last twenty years or so that we have seen growth in this field of Byzantine studies following the pioneering work of Basil Tatakis (1896-1986) and Linos Benakis (b. 1928-). More recent work has taken the subject forward by defining what is meant by ‘Byzantine philosophy’, rather than ‘philosophy in Byzantium’. Study of the subject remained problematic because few took the Byzantines seriously, often because it was thought there was no one who stood comparison with the great medieval figures of the Latin west or the Islamic east. Thankfully such comparisons are no longer made with scholars prepared to discuss Byzantine philosophy as a topic its own right. However, much work awaits the editing of Byzantine philosophical texts as well as the reception history of those texts, both in Byzantium itself and by other cultures. The website and blog has been started under the auspices of the Department of Ancient History and the Ancient Cultures Research Centre at Macquarie University in Sydney, Australia. The administrators invite anyone interested to register and to start contributing to the Network. Podcasts on the History of Philosophy. Peter Adamson, Professor of Philosophy at the LMU in Munich and at King’s College London, takes listeners through the history of philosophy, “without any gaps.” The series looks at the ideas, lives and historical context of the major philosophers as well as the lesser-known figures of the tradition. In this series Peter Adamson tackle the third of three parallel traditions which unfolded in the “medieval” period: philosophy in the Christian East. 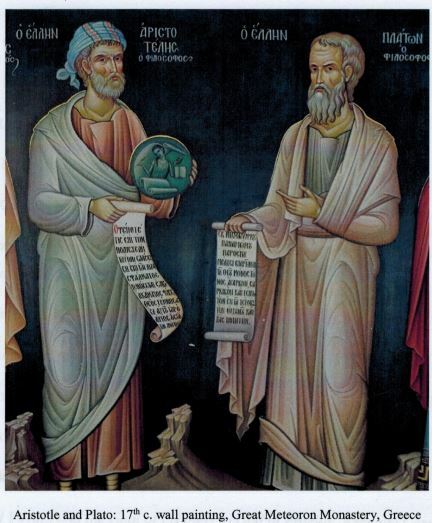 The main focus is on philosophy in Greek, produced above all in the capital of the Byzantine empire, Constantinople. Peter Adamson and his interlocutors look at efforts to preserve and expound the Hellenic intellectual inheritance, and the debates that ensued as some thinkers were deemed to embrace pagan learning too eagerly. They also explore the philosophical interest of other aspects of Byzantine life like iconoclasm, religious movements such as Hesychasm, political theories, history writing, and women in positions of power. Attention is however also paid to other realms of Eastern Christianity, with traditions of writing in Syriac, Armenian, and Georgian. This series also features interviews with Katerina Ierodiakonou, Andrew Louth, Dominic O’Meara, Oliver Primavesi, and Michele Trizio.